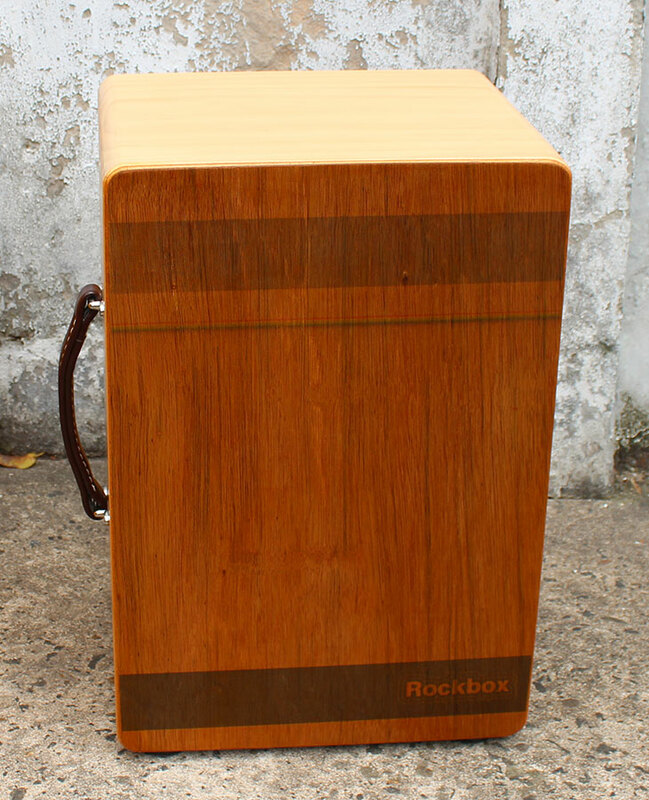 Same size,same timber as the pro model Rockbox cajon, but with a different snare system. The new standard model rockbox has an adjustable snare (new pat pending) attached from the top of the cajon, quite unique in the world of cajons. The frame is made from sustainable New Zealand plantation pine, each piece of timber is carefully selected for qualities such as grain and straightness. The back of the drum is the same just thicker ply 6-7mm. The new (pat pending) adjustable snare is simple and elegant in it's design.Allowing forward and backward movement as well as twisting. The snare can be removed and replaced in seconds by one hand.No tools necessary. If a professional, durable, amazing sounding drum is what you are looking for, please come and test my drums and hear the difference. I also have a selection recently made from recycled materials, including; Queensland Maple, Australian Red Cedar, Oak and various Australian hardwoods. Workmanship warranty: does not include freight charges to and from for overseas buyers. The front hitting panel is just 3mm thickness and is not guaranteed against breaking. Meaning if you put your hand through it by hitting it way too hard it's not under warranty. In normal circumstances this should not happen! One incident in 11 years. the sound hole feeling around to see how it works, my warranty doesn't cover this. Billy Handley playing the standard model rockbox cajon drum at the conservatory of music recording room in Sydney. Playing some funky rock beats, and a bit of jazz. This model also comes with the tree design as seen in the video below. The video was shot with a Panasonic HDC-HS900 camera in a dead recording room. I imagine it will sound epic with the neumann microphones we used and a bit of reverb added. Still waiting for the recording from the con. If "Pick up" is not possible, please email me for shipping costs and payment details.